Money Transfer Scams. Learn the Secret Behind Scammers Using UK Phone Numbers. Latest Educative Article on Money Transfer Scam phone call scams. At Flextel’s website((http://www.flextel.com), scammers can sign up for Numbers Starting With +4470, +44 870, +44 871, +44 844, +44 845, +44800 etc. 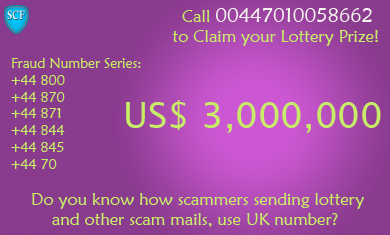 Calls landing on these numbers will get forwarded to the Scammers number in Timbuktu or wherever they are! We do not know whether Flextel has any policy related to misuse of numbers by scammers for conducting cyber crime! The way these numbers are being used freely by scammers across the world, we can presume that Flextel and other Virtual Number Operators give 2 hoots for probity. One thing is certain. With the ample assistance of Flextel, Scammers are able to convince potential victims that the messages of bogus lottery, fake business deals or a fraud loans have all arrived from abroad and hence the offer could be legitimate! Now you know how the so called Daniel Jacob runs his fraud loan operation in the ambitious name of Factor Funding Company (www.factorfundsinvestment.org), sitting in a rickety office, in some remote corner in India!